This week saw two phenomena occurring. Firstly, the eclipse of the HUGE sun by the much smaller moon. For some reason we didn’t catch up with it until all the glasses had been sold but even without looking at the sun, there was an atmosphere of stillness and peace whilst it was happening. The other happening was the procession of the remains of the last king of England to die in battle, Richard III. He is to be interred at Leicester Cathedral having been found in the foundations of a car park! Julia–Tess closed her comments so can I add a thought here? 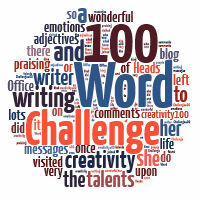 I love how that lady leaves me with so many questions on every 100-Word Challenge. Amazing.